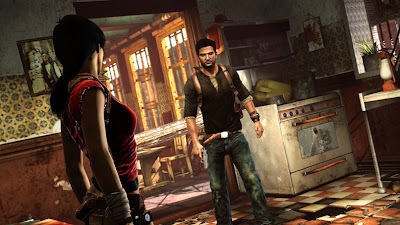 Uncharted 2 offers interactivity in terms of how you reach your goals: you can use stealth or action, attack a situation in a variety of ways, and clamber over half of the environment. But no matter how you play the game, the results are always the same. This is always the case in games with linear plots, and the approach serves Uncharted 2 well. While the game doesn’t capitalize on the ultimate potential of interactive entertainment, the linearity allows the game an incredible sense of focus. The characters are likeable and well-defined, and each scene plays out beautifully. The mechanics of the game are all well-realized: the jumping and climbing functions just as well scaling a cliff face as it does jumping from truck to truck as they race along a snowy mountain side. Uncharted 2 accomplishes something that video game designers have been striving to do for years: it successfully captures all the drama, excitement and fun of a big-budget action-adventure movie. The additional interactivity makes it even better than a Hollywood blockbuster, because any accomplishment that Drake enjoys is the player’s, as well. Uncharted 2 is a fantastic game, but its power is in its execution, not any form of innovation. There’s absolutely nothing wrong with that, but I hope that it motivates other developers to branch off in different directions entirely. There are a few schools of thought on how to make video games. With Uncharted 2, Naughty Dog has conquered the Hollywood school of game design, focusing on characters, linear stories and epic action. Uncharted 2 is the new gold standard, and Naughty Dog has charted the path to success in games that feel like movies. There are other realms to explore and innovations to discover in video games, but they lie down different paths. Granted, I've only seen parts of this game and some of the original, but I wonder what's so great about creating a game that feels very much like a real action movie when the real action movies that it is imitating are crappy to mediocre Jerry Brucheimer action flicks? I agree it's impressive that they can capture that aesthetic so accurately and genuinely, and the point is well taken. But ultimately what does one take away from such a game? Personally, I wish developers would STOP trying to make their games so much like the cookie cut action movies we are bombarded with in theaters. Well firstly, Uncharted 2 is more like a super awesome action-adventure movie like Raiders of the Lost Ark, than some janky Bruckheimer catastrophe. And it IS more fun because you're playing it. But your point is well taken: spending all the talent of a great developer on imitating Hollywood is a real shame. Hopefully plenty of developers will spend their time really exploring the medium's possibilities instead. Although I expect that in one way the video game industry is a lot like film: there's likely to be mostly brainless blockbusters as well as more thoughtful, intelligent works for the foreseeable future. I'd much rather play a brainless action game than watch a brainless action movie. At least then the mechanics and gameplay can be fun enough to balance out the terrible script and plot. Uncharted certainly has mastered the roller-coaster action of Hollywood movies. Was there any question that it couldn't? The question I want answered is whether it can match film and literature in its relatable qualities, the exploration of something not only meaningful but interesting and emotionally exploitive.